Lescasse Consulting is specialized in developing Windows and Web applications using APL+Win and/or C#. Lescasse Consulting also specializes in developing tools for APL+Win developers. In this whole site LC refers to products developed by Lescasse Consulting. (1) News remain 30 days on the Home page. For all the developers who want or need to convert their APL+Win applications to C#, AplEngine is a C# DLL that can be referenced in a C# project and provides developers with an APL interpreter within their C# projects. AsmFns is a C# ActiveX and can be used fromC#, APL+Win and Dyalog APL. With AsmFns you can much more easily port parts of, or entire, APL+Win applications to C#. MapsDX is a C# ActiveX User Control that you can use in your APL+Win Forms to display all kinds of maps. A comprehensive API allows you to zoom, pan, add text overlay, use minimaps, add push pins, display tooltips, colorize, display attributes, show or hide navigation panel elements, etc. PdfViewer is a C# ActiveX User Control that you can embed in your APL+Win Forms. PdfViewer allows you to display local or Web PDF documents in your APL+Win Forms: its ribbon icons allow you to Save, Print, Zoom, Search, Extract Tables, Display Links, etc. You can also do all of this and more programmatically from APL+Win with its API. PivotChart is a PivotGrid C# ActiveX User Control that you can use in your APL+Win Forms. With its drag & drop User Interface you can cross tabulate your data with simple mouse actions and analyze your data in seconds from any perspective. Additionally you can select data within the PivotGrid and your selected data is automatically displayed in one of the 30 or so supported types of 2D and 3D charts. RibbonDX is a C# ActiveX User Control that you can add to your APL+Win applications. With RibbonDX, you can give your APL+Win applications a modern look and make them much more attractive. SQL is a C# ActiveX DLL which you can use from APL+Win to maintain your data in MS Access or MS SQL Server databases. With SQL you can programmatically Create, Build, Populate, Query, Structure, Update, etc. local and remote databases. It supports Creating, Running, Dropping, Listing, etc. Stored Procedures in SQL Server databases. SSGear is a C# ActiveX User Control that you can use in your APL+Win Forms. SSGear is a spreadsheet highly compatible with Excel. With SSGear you can create, load, save, import, export, format, populate, read, etc. Excel workbooks programmatically from APL+Win. SSGear is also more than 100 times faster than using Excel.Application! DotNetVersion is a small C# WinForms application finding and displaying all the .Net Framework versions installed on your machine. LC.Charts is a freeware for APL+Win Users who are current with their subscription; it allows them to easily and instantly display their APL variables in various types of charts. The license allows any use of LC.Charts: you can even include LC.Charts as part of software you sell: the only restriction is that you are not allowed to sell LC.Charts as such. LearnAPL is a free APL+Win Runtime application that simulates an APL+Win Full Interpreter. 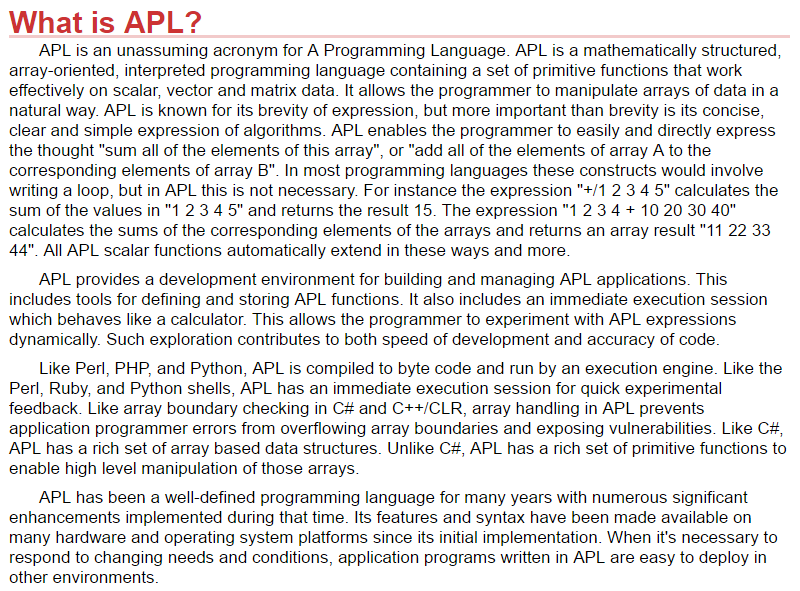 It allows you to explore most aspects of the APL+Win language. With LearnAPL you can develop APL+Win applications, save and load workspaces. You can also explore and learn more about the powerful zObjects development Framework as well as other Lescasse Consulting products, take an APL Quiz, view some Videos, etc. zObjects is an extended library of APL+Win and .Net objects intended to make it much easier to develop APL+Win applications. zObjects allows to develop perfect APL+Win User Interfaces with limited efforts. zObjects has required years of development and is free for APL+Win Users. zREngine is a freeware for APL+Win Users who are current with their subscription; it allows them to use the R statistical package from APL+Win v17+. With zREngine you can run any R command and display any R statistical plot in an APL+Win Form. zREngine is part of the zObjects freeware. APL+Win, first introduced around 1995, is an enhanced version of APL that allows to build any kind of Windows desktop applications with great User Interfaces while still maintaining the traditional conciseness, purity and speed of the APL language. To experiment with the latest version of APL+Win, learn more about APL, develop small workspaces, etc. , download and install LearnAPL (it is free). Dyalog APL is a very rich ISO/IEC 13751-compliant version of the APL language developed by Dyalog Ltd. Dyalog APL includes nested arrays, namespaces, control structures, functionnal programming, object oriented programming, a direct interface to .Net, point free or "tacit" syntax and futures and isolates for parallel programming. MACfns is a suite of machine code and associated APL cover functions which substantially exceed the performance of APL primitives and code.